STANDING OUTSIDE MICHAELA GLEAVE’S WEATHER-INSPIRED INSTALLATION, OUR FROZEN MOMENT, I’M HOLDING THE POSTCARD ADVERTISING PERFORMANCE SPACE’S DIMENSION CROSSING SEASON IN MY HAND. PRINTED ONTO THE CARD IS A PHOTOGRAPH SHOWING TWO ORDINARY GARDEN SHRUBS AND A TIMBER LATTICE FENCE BATHED IN A LUMINOUS, ALMOST SPECTRAL, WHITE GLOW. The photograph by Gleave is a telling image that reveals a heightened attunement to the subtle intricacies of natural phenomena and the ways in which we perceive them. It’s this sensitivity to the intertwining of nature and culture that largely informs Gleave’s practice and was strikingly apparent in her dramatic, large-scale contribution to the Dimensions Crossing program. Coupled with Robyn Backen’s site-specific work, Whisper Pitch, these two experiential architectural structures activated the Carriageworks site, luring visitors into engaging spaces where one felt more like a receptor than a mere spectator. In keeping with her desire to transport the viewer, Gleave located the installation’s entry at the rear of the Bay where a dressing room housing the protective wet weather gear awaited. Having navigated my way into a black plastic poncho and slipped on a pair of heavy-duty gumboots, I plodded toward the blackened environment of the main exhibition space. Like swimmers contemplating a dip in the ocean, some visitors stood hesitantly at the threshold while others ventured boldly inside where a continuously strobing white light spliced through the darkness. At the centre of the room, cloaked spectators ascended the stairs onto a stage-like platform fenced by a wire balustrade where water drizzled from the ceiling. As we stood on this platform beneath the artificial rain, the visual spectacle at the heart of the work unfolded as the white light of the strobe refracted off the tiny particles of water, poetically transforming the droplets into what resembled an all-enveloping confetti of star dust. It was an otherworldly optical phenomenon that re-imagined such barely perceptible natural effects as the fogbow into a full-blown cinematic style atmospheric event. While her installations recall the sensorial art-science experiments of Icelandic artist Olafur Eliasson, where Gleave differs is in her more playful engagement with our infatuation with epiphanic moments, lending itself to work of a more performative character. 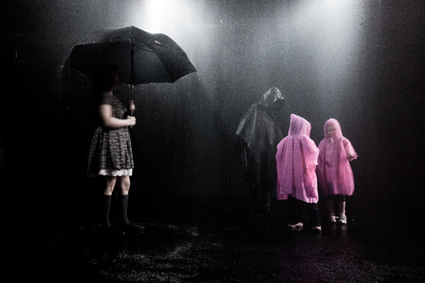 The theatricality of Our Frozen Moment evolved from an earlier project which involved creating a storm sequence for a play and Gleave was interested in recreating the stage within a black box environment for this installation. What was unexpected about the spectacle was its somewhat unnerving and abrasive edge—the effect of the strobe lighting soon shifted from dazzling to disorienting and the water irrigation closer to a drenching than a fine mist. It’s hard to know whether this was intentional as the installation was to some extent technically unresolved with the management of such large quantities of water proving particularly difficult. A gentler immersive environment might have given viewers more contemplative time amidst its wonder-provoking effects. Yet for those able to withstand a certain level of physical discomfort Gleave did offer an unusually intense collective experience that emphasised the destabilising influence of environments upon mental states and the fine line between the joys of illumination and the terrors of hallucination. Coinciding with the installation period of the Dimension Crossing program, Carriageworks hosted an unrelated fashion event over the last weekend of April that ramped up the ambient noise of the space to a maximum—testing conditions for Robyn Backen’s Whisper Pitch installation at the southern end of the foyer. Here, this architectural anomaly of a pair of twin parabolic brick structures was seamlessly inserted as a space within a space, beckoning the odd stray photographer or curious fashionista into its encasing, womb-like interior. From the outside, the brick walls with their roughly applied sand coloured mortar recalled a fragment of a ruin or the imperfections of vernacular architecture. By contrast, the smooth grey render of the interior mirrored the existing Carriageworks brickwork and created a sense of resonance with the surrounding architecture. 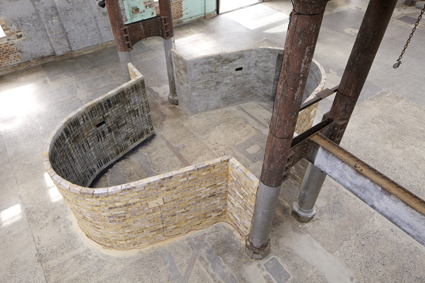 The physical form of Whisper Pitch took its cues from the parabolas of the acoustic architecture of such sites as the Whispering Gallery of Gol Gumbaz in Central India where sounds can be echoed seven times, and in ideal conditions Backen’s installation would have sought to reproduce these echoing effects. Amid the ambient noise of the Carriageworks site, however, Backen sensibly elected to work with the more controllable medium of recording technology, which opened up its own unique possibilities. Looking directly through the rear entry and down a narrow passageway, a projection of unobtrusively placed black-and-white film was visible—a ‘ghost image’ from Fellini’s La Dolce Vita (1960) showing the scene where Marcello receives a marriage proposal from his lover spoken via an echo chamber. Within the spare and minimal confines of the brick parabolas, the intimate estrangement of the characters made an uncanny return as the script of their disembodied conversation (“Marcello, can you hear me?”) was spoken in the hushed whispers of female voices in seven different languages, the recording bouncing back and forth between four black rectangular speakers embedded in the installation walls. By situating the speakers within the walls, Backen drew visitors into an intimate relationship with the architecture as they leaned closer and paced their perimeter to discern and trap the source of the whisperings. Whether or not the visitor was aware of the origins of the audio array as translations of the Fellini script (the projection was unfortunately situated some distance from the installation due to constraints in blackening the space), this slippery and ever shifting cacophony of voices, sometimes singular and coherent and at other times overlapping and polyvocal, evocatively conveyed a sense of the broken and incomplete nature of communication and the inherent difficulties of meaning. Complemented by scribbly black lines of Morse code inscribed onto the walls in charcoal, the sound installation pointed out both the limitations of one-sided communication as well as its generative possibilities as the mind works to fill in the blank spaces with its own imaginings, revealing communication to be a seductively expansive and relational exercise. Backen’s installation also gracefully commanded the void of the Carriageworks foyer with a human-scaled intervention that thoughtfully engaged the senses at multiple levels. Gleave’s installation was more raw, yet despite its engineering imperfections at a visceral level, it too succeeded in forging ephemeral phenomena into a memorable art experience where the viewer’s own embodied shift in perception took centre-stage.